How Does Systems of Sight Work? 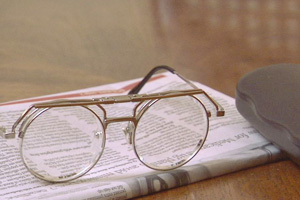 Unlike other low-vision devices, Systems of Sight low-vision eyewear is worn like regular eyeglasses. In addition, Systems of Sight allows wearers to see at a distance as well as close up, helping one regain their independence. This is unlike many other devices that only address distance (telescopic) or close-up (magnification). The Systems of Sight low-vision device prism technology redirects images to a healthy quadrant of the macula (or island of cones). This allows the wearer to see straight ahead without as much of the interference associated with the central damaged area, or scotoma. Even though there are two lenses per eye, the device is not telescopic due to the minimal separation between lenses. The wearer maintains their full field of vision and depth perception is not affected assuming the wearer is using both eyes. Each device is made with unique dimensions using strict tolerances for a custom made product for each client. For more information, call 800-435-7706800-435-7706 or email us now.